These microscopic four-legged mites infested Cannabis plants in a secure greenhouse at Indiana University. This picture shows them on a leaf petiole that was about 2 mm wide. Hi Karl! Fascinating photos of these mites. I was curious about how confident you are in your ID? If you could cite some references or other info which helped you confirm the identity of these mites that would be helpful. For instance, how might one separate this species from other similar mites which might also infest hemp plants? The mites were identified for me by John McPartland, a leading authority on pests and diseases of Cannabis. McPartland, J.M., R.C. Clarke, and D.P. Watson. 2000. Hemp Diseases and Pests. CABI Publishing, Wallingford, UK. McPartland, John M. and Karl W. Hillig. 2003. 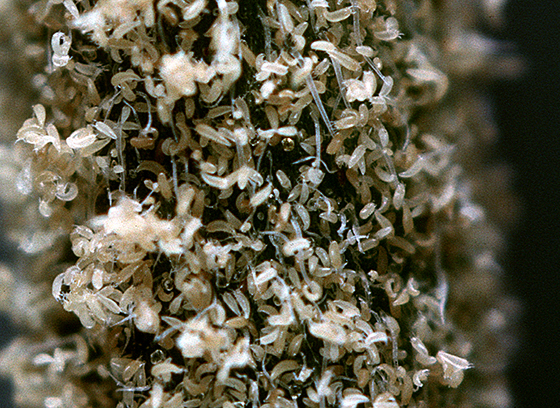 The Hemp Russet Mite. Journal of Industrial Hemp 8(2): 107-112. The second reference includes a photomicrograph of one of the mites. This is just the information I was hoping to receive -- Thanks, Karl! I will go ahead and create a new page in the guide and move your images there. In the future, if you submit images to the guide and are certain of their identity but there is currently no guide page for them, you should go ahead and submit a topic to the Requests for Additional Guide Pages section of the Forums. This site is an amazing resource. Thanks again for submitting these valuable images! Could one of you be so kind as to suggest control/ irradication methods? perhaps post info on my FB page?